ORANGE SINK: "Autumn Trio" Paper Pattern Release! It's a great pattern, Cathy! Oh Lordy, I gotta have it!! You have the most beautiful and fun designs, Cathy ! Looks like it would be fun to hook. 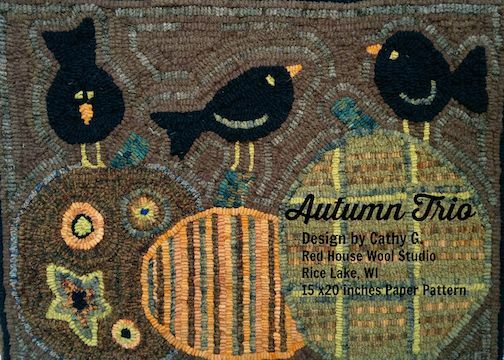 Cathy, your new pattern is just about the cutest bunch of crows and pumpkins ever. What a fun rug. I bet the patterns will be flying off the shelf. All the best to you. I'm always so impressed by your classy designs. Dropping in for a sec to let you know that I am teaching a class starting the 22nd of October and one of my students is bringing this pattern. Made me realize I haven't reached out to say hi in a long time. Hope all is well and I think of you often. This mat is adorable!! !